Rapid and accurate repair of material flaws due to stress, fatigue, and corrosion is a key to aircraft component maintenance. Both space and aircraft systems represent the potential for enormous economic loss due to structural failures as well as possible impacts to the public safety. Similarly, structural integrity for airframes is a critical safety factor within military and civilian aviation communities, especially with the increasing age of the airframes in use within the military and civilian fleets. This is especially important when airframes have already been repaired because of structural cracking. To address this problem, a number of advanced techniques for nondestructive inspection/testing (NDI/NDT), hereafter referred to as NDT, show the potential to detect the existence of repair defects at the maintenance facility or depot. These include acoustic emission, thermography, holography, radiation, magnetics, liquid penetrants, ultrasound, eddy current, and ultrasonic inspections as a means to find material defects without destroying the component under test. All of these methods have their uses and their limitations. A major limitation with most NDT methods is the need for extensive material preparation and subjective manual evaluation of the test or inspection results. Martingale Research has developed new methods for applying high speed computers, digital signal processing, and our proprietary neural network technology to automatically process acoustic signatures. This will allow structural components to be evaluated with high reliability, thus providing assurance that the structure under test is suitable for continued service. Martingale's acoustic signal detection and classification technology is derived from its acoustic emission (AE) research, which has been sponsored by the National Science Foundation. Acoustic emissions provide a powerful method for monitoring of structures which are subjected to fatigue and have been applied within industry for several mission-critical applications. This includes successful detection of cracks in reactor vessels, highway bridges, and Polaris rocket motor casings, as well as limited application within the aviation industry. Acoustic emissions have been known to occur in materials under stress for hundreds of years. 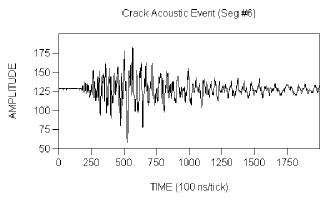 The cracking of wood structures prior to collapse, groaning of mine timbers, popping and groaning of oil storage tanks and other such sounds are all examples of acoustic emissions. When metal cracks, acoustic emission occurs because of discontinuous crack growth (steel) and brittle particle fracture (aluminum), and can be detected with the aid of special transducers. For example, piezoelectric transducers acoustically coupled to a metal surface can detect an AE event by reacting to the minute metal deformations associated with the passage of the stress wave through the structure. The stress waves customarily manifest as Rayleigh waves that produce minute flexures in the surface as the wave propagates allowing material fatigue to be monitored. Similarly, the integrity of a material can be examined by analyzing acoustic signals detected by utilizing mechanical or ultrasonic excitation techniques. In both cases the acoustic signals can be captured by recording the electric signals from piezoelectric transducers temporarily attached to the area being evaluated, which can then be processed and analyzed. The figure below shows a typical acoustic emission signal recorded by a commercial piezoelectric transducer. The NDT technology developed by Martingale Research Corporation utilizes advanced neural network techniques for the detection and classification of acoustic signatures from crack growth, corrosion, and material delamination under either mechanical excitation.